WHAT WE MAKE: Our obmwang tassels and triangle banner are made of high quality paper,lightweight and environmental-friendly, does no harm to body. And the balloons are made of latex with confetti inside to make your party more attractive. PRODUCT SPECIFICATION:The length of the gold tasel is about 36cm/14.2\", while the other color ones are 34cm/13.4\",each small flag of the triangle banner measures 9.5 * 13cm/3.7 * 5.1\", with the total length about 3m/9.8ft. EASY TO USE:All the paper decorations are packed individually and flat for convenience shipping, you need to make it by yourself, they are easy to assemble,detail instruction please see product description below or picture. POPULAR PARTY SUPPLIES: Our party decoration pack is a great choice for festivals and parties decoration. 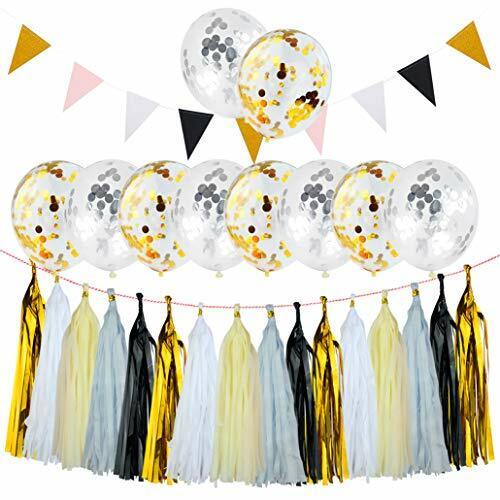 The tassel garland with banner and confetti balloons are perfect for birthday party, christmas, halloween, baby showers decoration,or other occassion creating wonderful effect at your party/ room. QUANTITY YOU WILL GET: The package will come with 1x Triangle Flags Bunting, 10x Balloons (gold & silver confetti) and 25x Tassels, each pack of tassel has a string for your easy hanging.